You can embed iFrame videos in the Rich Content Editor using an external video's direct URL link. You can also use the HTML embed code in the media player. To locate the embed code, locate the video element that displays the HTML code for the video. Embed codes are commonly found in the video's sharing options. Open the Rich Content Editor using one of the Canvas features that support the Editor. Click the Insert Media icon. The media window defaults to the General tab. To embed the video using a direct URL source, paste the URL for the video in the Source field . The video's dimensions will automatically populate the Dimensions fields . The Dimensions fields can be used to resize the video. If you want to maintain height and width proportions when changing the video dimensions, click the Constrain proportions checkbox . To embed the video using an embed code, click the Embed tab  and paste the code in the text field . When you use the Embed tab, the General tab will automatically update the Source and Dimensions fields according to the content in the embed code. To insert advanced options for browsers that don't support the source video encoding, click the Advanced tab . To specify an alternative source for the video, enter the URL in the Alternative source field . Alternative source URLs can be used to specify a different video encoding in case the browser doesn't support the initial encoding offered. To specify an image that displays until the user clicks the play button, enter the URL in the Poster field . If the Poster field is blank, the first frame of the source video will be used as the poster image. Note: Links from common providers (like YouTube and Vimeo) often link to custom media players and will not recognize any content added to the alternative source and poster options. To close the media tool, click the Ok button. Preview your video in the Rich Content Editor. To save changes to your course content, click the Save button. Previous Topic:How do I link to a YouTube video in the Rich Content Editor as an instructor? 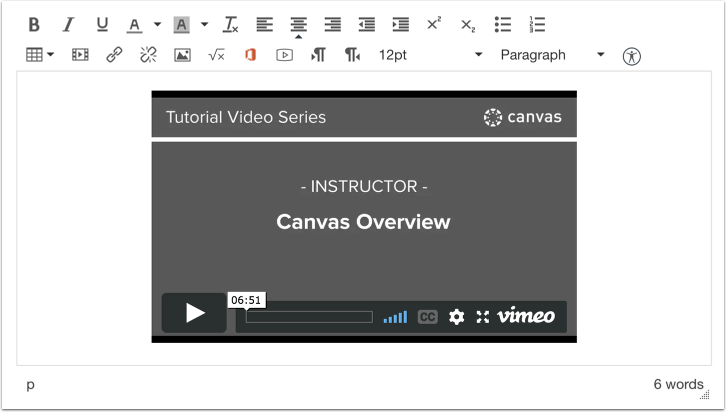 Next Topic:How do I record a video using the Rich Content Editor as an instructor? Table of Contents > Rich Content Editor > How do I embed iFrame videos using the Rich Content Editor as an instructor?